By now, everyone is familiar with, if not addicted to, Instagram, that plucky little app that launched in 2010, has grown to over 100 million users and was purchased by Facebook for $1 billion. Sure it is fun to take the photos, add some filters and share them but don’t you wish you could do a little more with the photos? Thankfully, there are now numerous other fun things you can do with your Instagram photos instead of just posting them to Facebook. Quick, can you name the most widely read magazine in the United States? I bet you didn’t know that it is Parade Magazine which has a circulation of 32.5 million and nearly 60 million readers. Additionally, the Parade Digital Partners, which includes Parade.com, has nearly 50 million unique visitors every month. Typically the magazine only has one main article mixed with some smaller articles and regular columns. 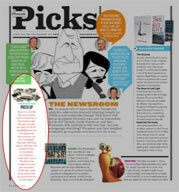 One such column is the “Parade Picks” column which highlights various books, movies, and products that the editors think their readers would be interested in.